In a summer of vapid blockbusters, The Big Sick is a charming, funny, poignant movie that shows that the American melting pot still works. The Big Sick did not have a name grabbing title drawing me to the theater. I checked out the charming trailer only after I noticed the movie was playing at our local town theater, where mostly independent or foreign movies play. I’m glad I did. The movie is a winner, by turns charming, fun, funny, poignant, and heartwarming. 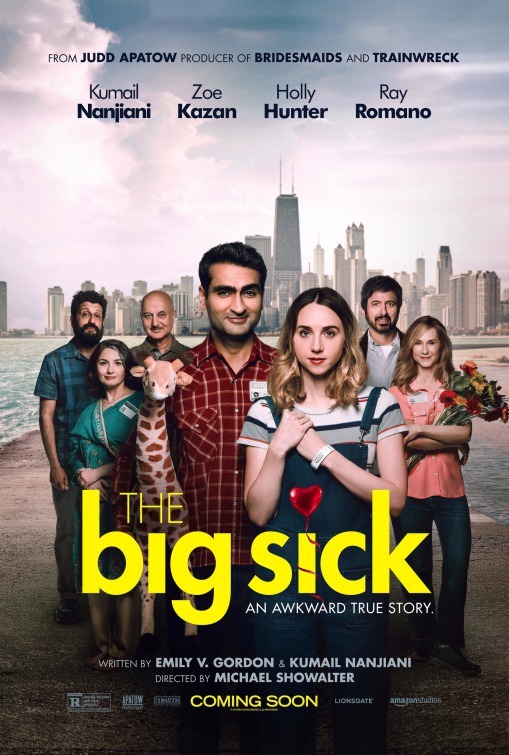 In the best sense of the genre that gives us so many lame, silly, stupid, crude, tasteless, or dumb movies, The Big Sick comes off as a nearly perfect, “Romantic Comedy”. It was not until the end credits that I learned this movie was based loosely on the real life romance of the co-writers, and the male co-star, Kumail Nanjiani. I was not aware of his fame, but he’s been around, mostly in TV circles, and is quite an accomplished actor. The movie, co-written with Nanjiani’s wife, Emily Gordon, is a story that is as old as time: Two characters who don’t have much in common when they meet nevertheless quickly fall for each other. Trouble eventually arrives when their families come into the picture. There begins the age-old dilemma: How much will the protagonists’ family traditions get in the way of their new romance? SPOILER ALERT AHEAD. IF YOU DON’T WANT TO KNOW A SIGNIFICANT PLOT POINT, STOP READING HERE AND JUST TAKE MY ADVICE TO SEE THIS DELIGHTFUL MOVIE, ONE THAT TRULY REFLECTS THE AMERICAN MELTING POT. Move The Big Sick up to the top of your queue for movies to see. It’s a great date movie, be it with your boy/girlfriend, or your spouse of 25 years.